Emily Palena from the Farm Institute grabs sausages from the cooler; behind, farm director Jon Previant keeps a tight lid on the merchandise. 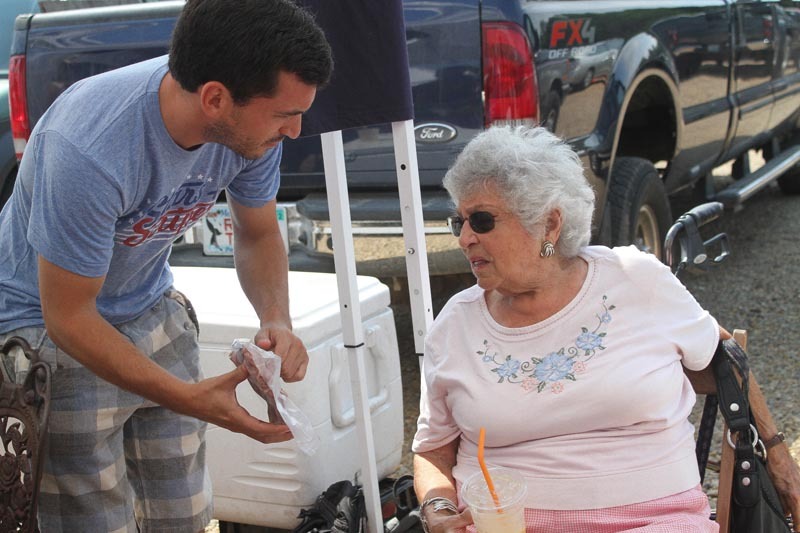 A crowd hovered at the entrance gate to the West Tisbury Farmers’ Market on Saturday morning, as workers from Morning Glory Farm unloaded 32 bushels of corn intended for sale at the farm’s market booth. The market didn’t open for another 10 minutes, but this crowd was armed and ready, with tote bags and baskets as their weapons of choice. West Tisbury is not the only farmers’ market that has been seeing crowds this year. Last week the U.S. Department of Agriculture reported a 9.6 per cent increase in its national directory of farmers’ markets. The USDA identified 7,864 farmers’ markets throughout the country, with the top three being California (827 markets), New York (647 markets) and Massachusetts (313 markets). And this summer Vineyard farmers who raise chicken, beef and pork say they have been hard-pressed to keep up with the growing demand for locally-grown meat. On Saturday ice-packed coolers filled with Island-raised meat lined the booths; two hours later the coolers were mostly empty. “Do you have any ground beef left? I would love a pound,” a customer asked Farm Institute director Jon Previant. Mr. Previant rummaged around the four coolers the farm had brought that morning that by then only contained a few odd cuts and some hot dogs. A few minutes later he found the last package of ground beef, which sold at $7.25 for a little less than a pound. One cow or beef steer yields 400 pounds of hamburger meat, Mr. Previant said, and it’s all gone in 21 days. 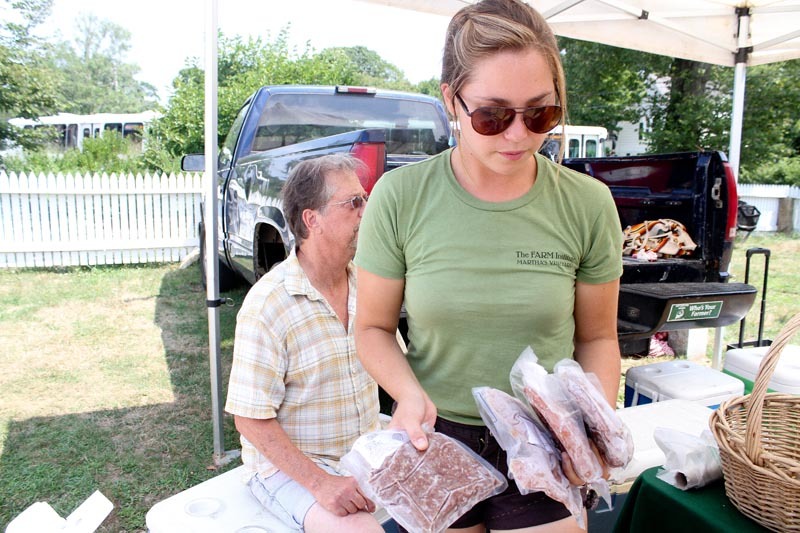 The Farm Institute sells 100 pounds of ground beef each week at Cronig’s Market in Vineyard Haven. In addition to hamburger meat, pork sausage has seen a “steady demand whether it’s grilling season or not,” Mr. Previant said, and odd cuts are also increasingly popular. Jefferson Munroe at the Good Farm and Richard Andre at the Cleveland Farm, who both raise poultry, have been able to keep up with demand so far but they’ve also increased their production by 50 per cent. The two farmers collectively are raising 3,500 birds this season. Mr. Munroe said his sales are up 100 per cent over last season. They also have increased production to carry them into the winter months, when demand for local meat is still high. Mr. Munroe sold out of his chickens in April; Mr. Andre sold out in January. “The chicken [growing] season is only in the summertime but there’s still a market for birds all winter long,” Mr. Munroe said. Conventionally-raised chicken sells for $6.50 a pound, while organic chicken sells for $7.50 a pound. Next season both farms will transition to all-organic feed. Meat availability at Morning Glory Farm has been low, which is normal for this time of year, farm owner Jim Athearn said. “Customers are definitely looking for it and anything we bring in sells right away, it just keeps growing and growing,” she said. The demand for Island-raised meat is now steady, Ms. McKay said. Allen Healy at Mermaid Farm, a popular Island dairy, agreed that the demand has put pressure on farmers here. “It’s hard to get to peak production while balancing peak demand,” he said. Demand for Mermaid Farm yogurt is well up this year, Mr. Healy said. Mr. Dix couldn’t say whether numbers are up over last year, but he could say with certainty that customer appreciation is on the rise. “The biggest thing is you get so many people thankful for what you’re doing; we hear more of that and it’s definitely increased over last year,” he said. The Martha’s Vineyard Agricultural Society Fair is right around the corner; entry forms for this year’s fair are due on Monday by 5 p.m. Fair booklets and entry forms are available at the agricultural hall. The Agricultural Society is also hosting a book-signing event for Bountiful: A History of the Martha’s Vineyard Agricultural Society and the Livestock Show and Fair on Wednesday at 7:30 p.m. at the a agricultural hall with author Susan Klein and photographer Alan Brigish.